Toli Makris, Songchai Ratanasuban protege is putting a card together which I have to assume by the announced schedule is the Thailand Vs. Italy installment of Thailand versus Challenger. Songchai has worked with Toli’s present promotional arm Elite Boxing to make sure this one land’s on Queen’s Birthday 2010. 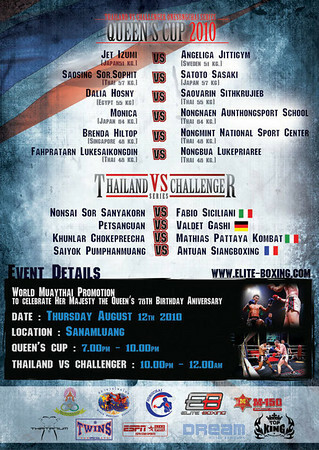 The event will be a part of the festival of fights at the 2010 Queen’s Cup on August 12 at Sanam Luang in Bangkok. The Queen’s Cup, which is the biggest event in the muaythai calendar for female fighters, is officially promoted by Songchai’s company, One Songchai Promotions. This year’s event will be marked by the first time Elite Boxing will be co-promoter for it. As part of the agreement, four TVC fights will be incorporated into the Queen’s Cup fight card. However, the biggest news is that the incorporation of TVC into the Queen’s Cup means that there will also be a break from tradition as male fights will be included to the event. The Queen’s Cup has been held in honour of Her Majesty the Queen of Thailand on her birthday, August 12, every year since its inception in 1996. Each year, a crowd of 100,000 spectators gather in the large open-air venue of Bangkok’s Sanam Luang (Royal Field) to pay their respects to their beloved Queen. Headlining the event will be Nonsai Sor Sanyakorn versus Fabio Siciliano of Italy. Nonsai is a real muscular and strong looking Thai boxer. Sadly, last I saw of him in action he got legitimately knocked out cold by a Chinese sanda fighter. I suspect this is going to be his proving grounds to prove it was a fluke and it should be an interesting fight back with such high scrutiny. Nonsai could be having a lot to prove going into Queen’s Birthday on a main event fight. Also co-main event will be Saiyoknoi Pumphanmuang versus Antuan Siangboxing. Saiyoknoi has sort of a death defying timing style and he makes fights interesting just by his risks that he takes and his ability to consistently pull it off. In a weird way he’s reminiscent of Kaoklai at his best. This should be a pretty decent and thoroughly entertaining card by the initial looks of it. Of course per usual, a new world title has been created in the WMC One Songchai Queen’s Birthday title. ~ by fatsoking on August 11, 2010.
that saiyok and antuan fight should be awesome. i think saiyok has a chance to overwhelm antuan and lay in some heavy shots but antuan is super slick. what a matchup! Should prove interesting. I was wondering if nthis the same Saiyok that got himself min a bit of trouble in thailand some years back. yeah i remember people talking about him on MMT. did he throw a fight? Allegedly, I am not sure what i think myself.